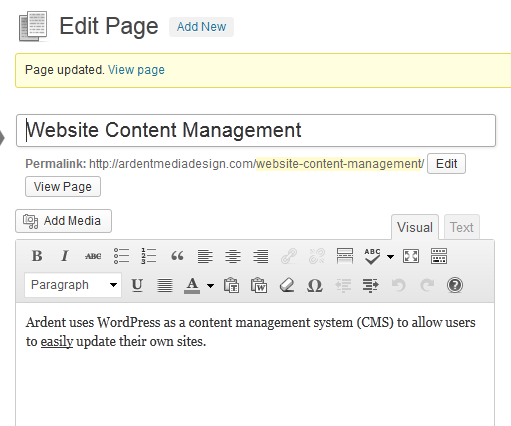 Ardent uses WordPress as a content management system (CMS) to allow users to easily update their own sites. Ardent provides customized WordPress based websites and adds its own expertise with Search Engine Optimization, visual design, and CSS styling knowledge to give you the best possible website based on the best Content Management System available. It’s extremely easy to use. It’s open source. There is no cost per user/seat licensing. It has a Simple Visual Editor or Text Editor with HTML support. And now it also has an amazingly simple yet powerful image management capability as well. Of course with its blogging roots, WordPress has incredible blogging and socialization capabilities built in and ready to go. 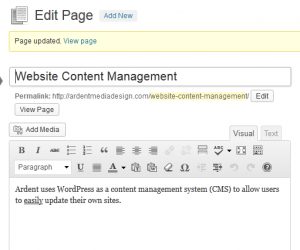 The overwhelming market share, superior ease of use, and massive plugin base for WordPress makes it an easily the right choice as a CMS for your blog or your next website.